Synchronized action is a powerful form of resistance against repressive regimes. Even if the action itself is harmless, like walking, meditation or worship, the public synchrony of that action by a number of individuals can threaten an authoritarian state. To be sure, synchronized public action demonstrates independency which may undermine state propaganda, reverse information cascades and thus the shared perception that the regime is both in control and unchallenged. This is especially true if the numbers participating in synchrony reaches a tipping point. As Karl Marx writes in Das Kapital, “Merely quantitative differences, beyond a certain point, pass into qualitative changes.” We call this “emergent behavior” or “phase transitions” in the field of complexity science. Take a simple example from the physical world: the heating of water. A one degree increase in temperature is a quantitative change. But keep adding one degree and you’ll soon reach the boiling point of water and surprise! A physical phase transition occurs: liquid turns into gas. In social systems, information creates friction and heat. Moreover, today’s information and communication technologies (ICTs) are perhaps the most revolutionary synchronizing tools for “creating heat” because of their scalability. Indeed, ICTs today can synchronize communities in ways that were unimaginable just a few short years ago. 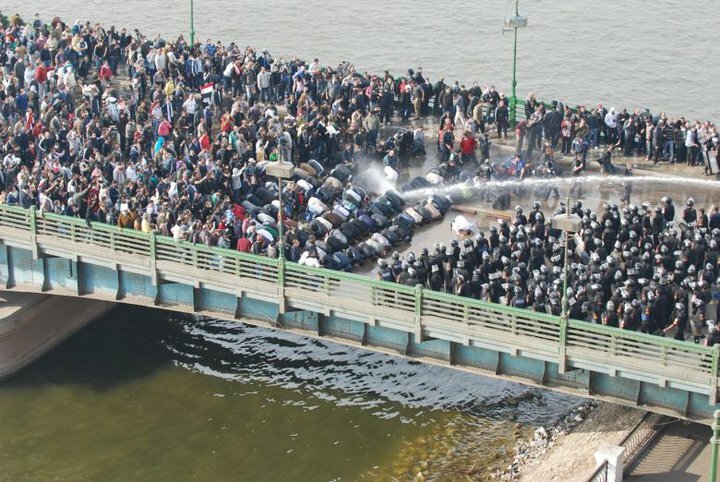 As one Egyptian activist proclaimed shortly before the fall of Mubarak, “We use Facebook to scheduled our protests, Twitter to coordinate, and YouTube to tell the world.” The heat is already on. Synchrony requires that individuals be connected in order to synchronize. Well guess what? ICTs are mass, real-time connection technologies. There is conse-quently little doubt in my mind that “the advent and power of connection technologies—tools that connect people to vast amounts of information and to one another—will make the twenty-first century all about surprises;” surprises that take the form of “social phase transitions” (Schmidt and Cohen 2011). Indeed, ICTs can dramatically increase the number of synchronized participants while sharply reducing the time it takes to reach the social boiling point. Some refer to this as “punctuated equilibria” or “reversed information cascades” in various academic literatures. Moreover, this can all happen significantly faster than ever before, and as argued in this previous blog post on digital activism, faster is indeed different. Clay Shirky argues that “this basic hypothesis is an updated version of that outlined by Jürgen Habermas in his 1962 publication, The Structural Transformation of the Public Sphere: an Inquiry into a Category of Bourgeois Society. A group of people, so Habermas’s theory goes, who take on the tools of open expression becomes a public, and the presence of a synchronized public increasingly constrains undemocratic rulers while expanding the rights of that public […].” But to understand the inherent power of synchrony and then leverage it, we must first recognized that synchrony is a fundamental force of nature that goes well beyond social systems. In his TED Talk from 2004, American mathematician Steven Strogatz argues that synchrony may be one of the most pervasive drivers in all of nature, extending from the subatomic scale to the farthest reaches of the cosmos. In many ways, this deep tendency towards spontaneous order is what pushes back against the second law of thermodynamics, otherwise known as entropy. Strogatz shares example from nature and shows a beautiful ballet of hundreds of birds flocking in unison. He explains that this display of synchrony has to do with defense. “When you’re small and vulnerable […] it helps to swarm to avoid and/or confuse predators.” When a predator strikes, however, all bets are off, and everyone disperses—but only temporarily. “The law of attraction,” says Strogatz, brings them right back together in synchrony within seconds. “There’s this constant splitting and reforming,” grouping and dispersion—swarming—which has several advantages. If you’re in a swarm, the odds of getting caught are far lower. There are also many eyes to spot the danger. What’s spectacular about these ballets is how quickly they phase from one shape to another, dispersing and regrouping almost instantaneously even across vast distances. Individual changes in altitude, speed and direction are communicated and acted on across half-a-kilometer within just seconds. The same is true of fireflies in Borneo that synchronize their blinking across large distances along the river banks. Thousands and thousands of fireflies somehow overcoming the communication delay between the one firefly at one end of the bank and the other firefly at the furthest opposite end. How is this possible? The answer to this question may perhaps provide insights for social synchrony in the context of resistance against repressive regimes. These types of networks often arise out of preferential attachment, an inherently social dynamic. Indeed, small world networks pervade social systems. So what does this mean for synchrony as applied to civil resistance? Are smart-mobs synonymous with synchronized mobs? Do ICTs increase the prevalence of small world networks in social systems—thus increasing robustness and co-synchrony between social networks. Will meshed-communication technologies and features like check-in’s alter the topology of small world networks? Examples of synchrony from nature clearly show that real-time communication and action across large distances don’t require mobile phones. Does that mean the same is possible in social systems? Is it possible to disseminate information instantaneously within a large crowd without using communication technologies? Is strategic synchrony possible in this sense? Can social networks engage in instantaneous dispersion and cohesion tactics to confuse the repressive regime and remain safe? I recently spoke with a colleague who is one of the world’s leading experts on civil resistance, and was astonished when she mentioned (without my prompting) that many of the tactics around civil resistance have to do with synchronizing cohesion and dispersion. On a different note, some physicists argue that small world networks are more robust to perturbations than other network structures. Indeed, the small work structure may represent an evolutionary advantage. But how are authoritarian networks structured? Are they too of the small world variety? If not, how do they compare in terms of robustness, flexibility and speed? In many ways, state repression is a form of synchrony itself—so is genocide. Synchrony is clearly not always a good thing. How is synchrony best interrupted or sabotaged? What kind of interference strategies are effective in this context? This entry was posted in Digital Activism, Social Media and tagged Networks, Repression, Resistance, Shirky, small, Strogatz, synchrony, Systems, Technology, World. Bookmark the permalink. Is there any difference in efficacy between impromptu social synchrony (civil resistance) as opposed to structured social synchrony (authority)? The flock of the birds in the video seems to be impromptu, and proves successful for most of its individual birds– and for that bird population– against individual or small group “invaders”. Also, the number/ agility in that flock versus the number/ strength of the “invaders” is a factor in that engagement. Do mobs come equipped with pre-planned or deeply-ingrained responses to urgent stimulai? Take Tunisian mobs as a for-instance: there were some organized leaders in the crowds. Leaders played a role in being able to actively assemble the crowd, perhapse they contributed to the ability to rapidly disperse it as well. Are there consistent leaders to the syncronity/action of human mobs? If so, it would seem to suggest super-empowered leadership. If not, it would bolster the case for deeply ingrained social responses.